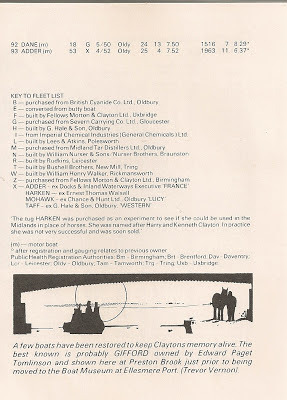 And so the last post of 2012, and what better subject than to return to the ongoing travels of the good ship Commodore. 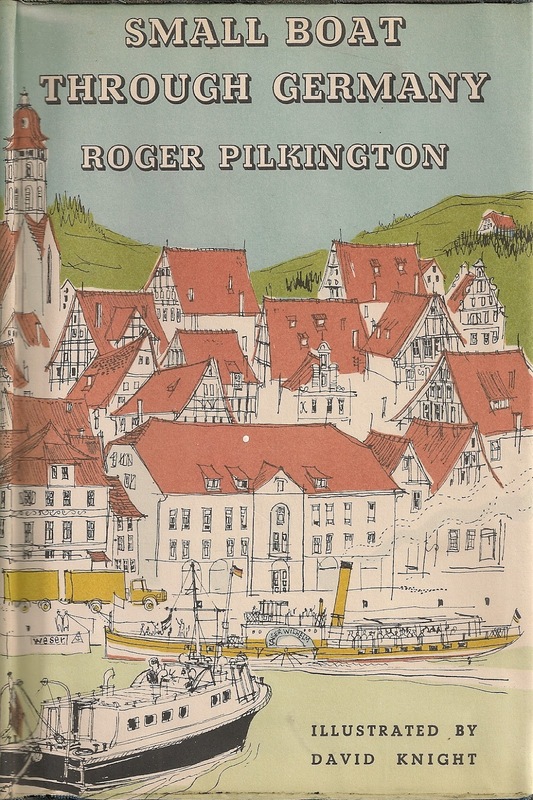 If you recall we left the Pilkington clan wintering their boat on the Rhine, the Commodore sheltering from the ice in 1962 and awaiting her further watery adventures along the German waterways. I knew that this episode would be particularly absorbing and I could tell that my anticipation was shared by Capt Pilkington all those years ago. No sooner had the Commodore fired up her engine and taken on board a pilot than she was off down the mighty Rhine and into Binger Loch, or Binger Hole. This was and remains one of the Rhine's great bottlenecks, a spot where the Rhine narrows and shoals causing the water to pour through at 8 to 10 knots. At this speed it is beyond the scope of many freight craft who had to enlist the help of a fleet of tugs who patrolled to and fro, dragging the barges up the 2ft step with foam mounded at their bows and the water churned into a seething froth from the stern. The section was so dangerous that there were approx 900 "incidents" each year. At the time of Commodore's passage the downward traffic passed down a water shute which ran at an estimated 10 knots. Taken as a whole the helter skelter run down the Rhine took just a day but such was Pilkingtons enthusiasm the account consumed all of 50 pages out of a 200 page book. With the Dutch border approaching they turned into the heavily industrialised canals of Western Germany, taking them round from the grime of Dusseldorf and the Rhur for Munster, Osnabruck and the Henrichenburg boat lift at Minden, gateway to the River Weser. The Weser consumed the bulk of the rest of the book. A lockless but fast flowing river which crawls south to north for several hundred kilometers. This is an ancient waterway and its history offers Pilkington rich pickings into its past and working practices. 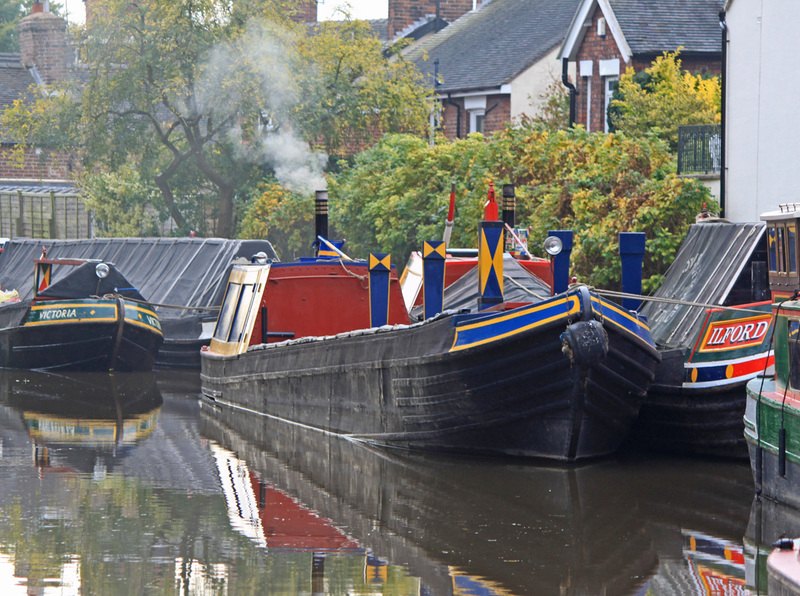 A few key take outs about this waterway. Due to its steady gradient it has been used by log rafts for many years, carrying timber from the Black Forest to markets far afield. It is naturally shallow, only maybe 2 ft deep and maintaining water traffic in the dry season involved a tidal wave being created from the Eder Dam, a pile of water which downstream craft rode for days on end. We are introduced to the concept of cold pressure travel, something I had never come across before. 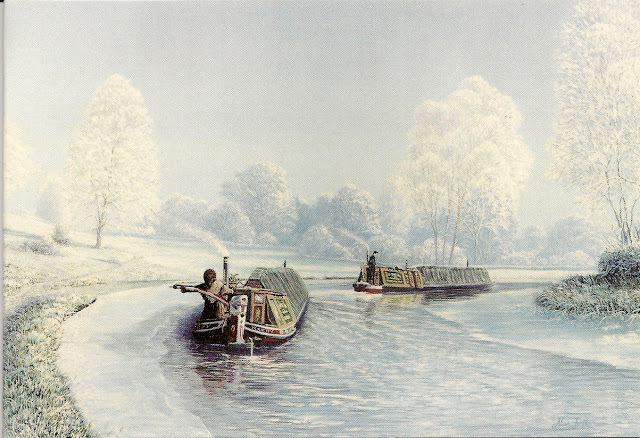 Such was the gradient on the river that an unpowered barge would slide forward at 2 knots, plus the current, which was enough to give them control and able to work their own way downstream. Stopping the timber rafts was an art in itself. This involved a wooden anchor which was embedded in an adjacent meadow and ploughed huge furrows which remained visible for decades. The flow made the upward journey very slow, even at full throttle, but gave ample opportunity to explore the surrounding towns and industries before turning tail at the end of the season and returning the boat to the Dutch base it started out from two years previously. Even this mega trip only scraped the surface of what is possible in Northern Europe and the book wistfully concludes with a list of other potential destinations - so many kilometers and so little time. During a recent visit to Ian and Karen of Nb Tacet they introduced me to Richard Dean's Canals of Birmingham. In spite of being an enthusiastic canal hunter on the BCN I had never come across this map which shows the BCN as it never was. Not that its inaccurate, just in its quest for completeness it includes all the branches and arms irrespective of when they operated. The end result is an amazingly detailed document printed in an aged sepia, a veritable treasure trove of obscurity. 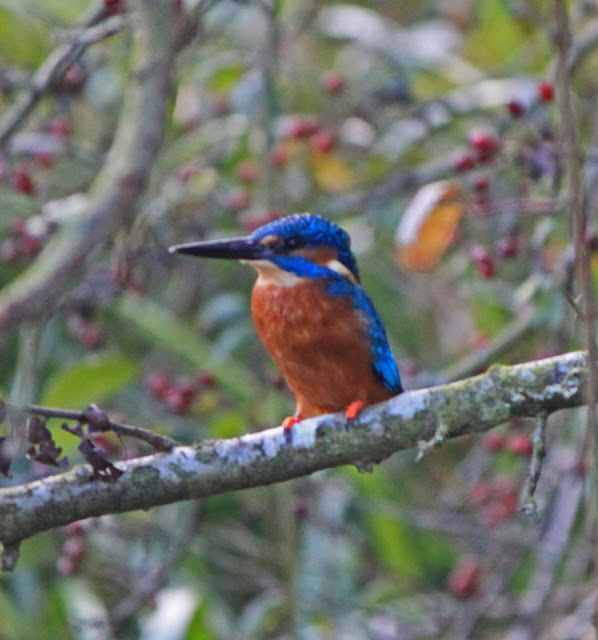 Take the Gospel Oak Branch - a branch abandoned in the 1950's leading off the Walsall Canal. 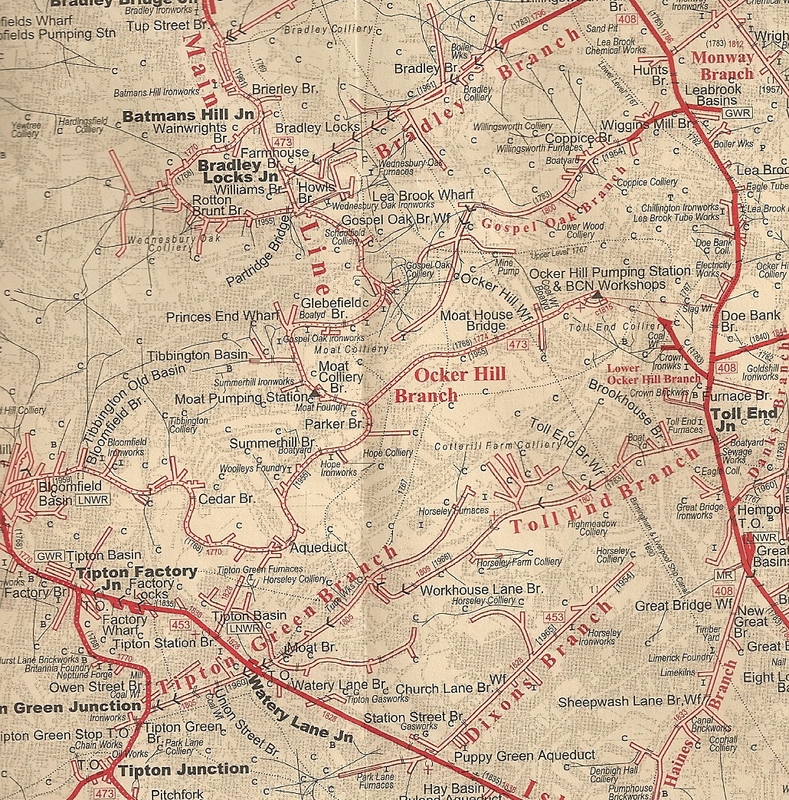 I have walked the line a couple of times in recent years and easily traced it to its terminus at the Gospel Oak Road. But after looking at Dean's map I realise that there was more to this branch in the shape of the Dumaresq Branch. 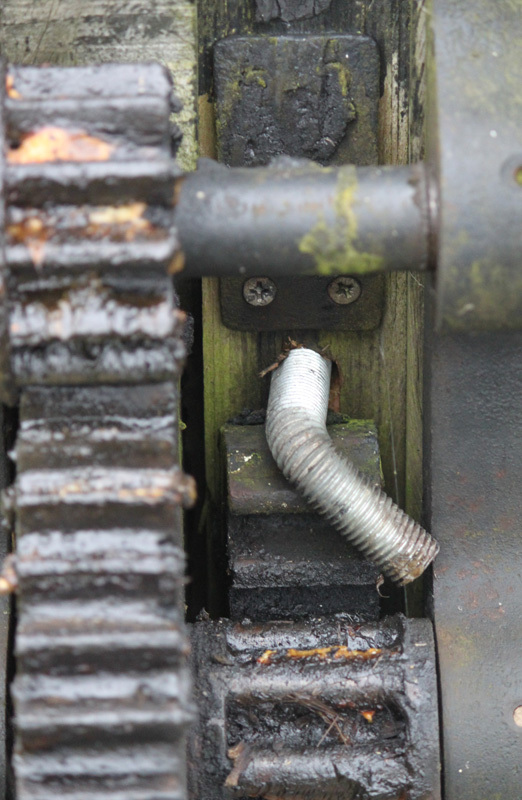 This half mile branch rose up through two locks to reach a mine. I referred to Ray Shill, the undisputed expert in such matters and he tells me that it existed for such a short period that it only appears one one map. Don't bother to go hunting for it - there is nothing there today. This find adds to the insanely complicated tangle of canals in the region and it sometimes appears that there was more water than land! I attach a small sample which illustrates the area. 2. It is the tallest tale I have read since "The Selected Works of T S Spivet". In a way the book does what its title describes. 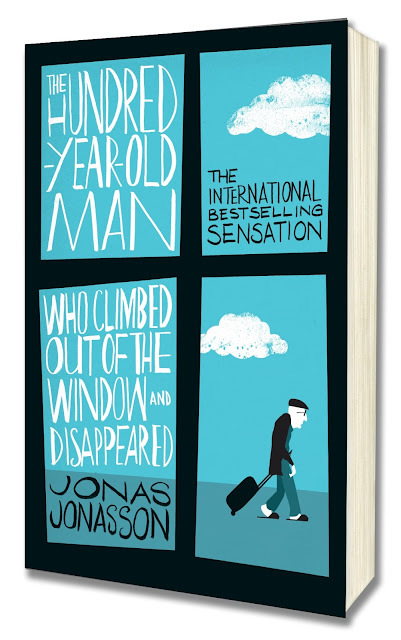 Its core character, Allan Karlsson approaches his impending 100th birthday party in an old peoples home in Sweeden with dread and does a runner through his window. Well, maybe more of a slippered shuffle - but off he goes making good his escape on a bus with an item of considerable value to highly frustrated criminal. The ensuing 300 pages chronicle his bizzare road chase, picking up accomplices along the way, "losing" baddies and baffling the police in black humour reminiscent of the 1950's "The Ladykillers. But it dosn't stop there. As the month long saga unfolds in 2005, Karlssons colourful life story is also told. This is a much used literary strategy but one which is particularly well deployed in this case. Over time the two stories converge to a present day conclusion. We are taken on a world tour of the 20th century with our reluctant and politically unaware hero both meeting most of the key world leaders and seemingly unintentionally influencing key historical events. Think Forrest Gump on steroids and you will get the picture. I know, you are thinking that this is absurd - and it is. But the book compels you to suspend your disbelief and accept each cameo as it occurs, along with the outcomes. You will be presented with snapshots of a string of US and Soviet presidents, along with Mao, Mrs Mao, Churchill, Franco, Charles de Gaul and a host of others, and then there is the atomic bomb. Oops - did I mention the bomb? Hey this plot is so far fetched and complicated its impossible to spoil the plot - you will just have to read it. This is a really good, funny feel good book which I read cover to cover in two days flat. If you have been given some book tokens for Christmas (who hasn't) and are looking for a good read grab a copy. Have a great day - God bless you and yours. Well, Christmas is almost upon us once again. The tree is up, the turkey is about to be cooked and the sprouts have been simmering for the better part of 6 months. My Christmas came a little early this year when Ian and Karen from Nb Tacet sent me a copy of Claytons of Oldbury to read. 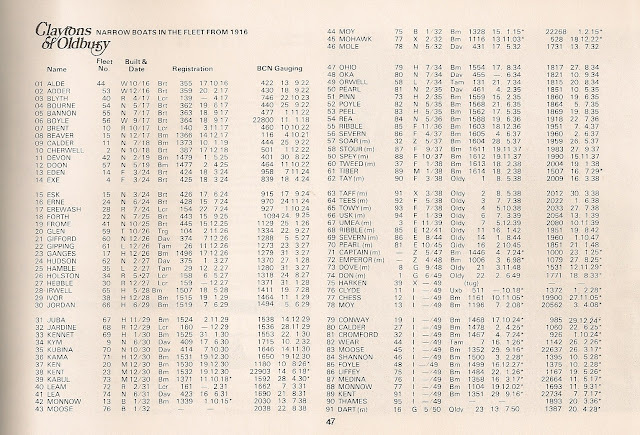 Claytons were one of the largest carriers on the BCN as its working days came to a close and this booklet gives an in depth review of their origins, divisions, bases, cargoes and boats. It is fact heavy to be sure, and anecdote light, but don't let that put you off if you have an interest in the BCN. The business can be traced back to 1842 when William Clayton set up a general canal haulage business at Salford Bridge, moving to Saltley about 20 years later and became specialised in the movement of crude tar by 1875. Crude tar, and associated chemicals, were a by product from the many gas works which peppered the major cities and towns of England. 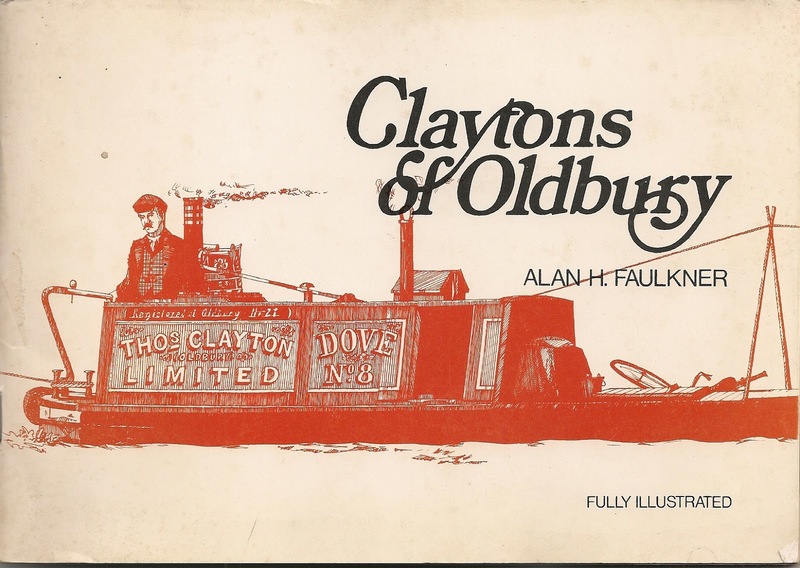 By 1889 the general carrying business had been merged into the new Fellows Morton Clayton and Co with the bulk tar traffic handled via a new company, Thomas Clayton (Oldbury) Ltd which mainly served Midland Tar Distillers. By 1935 they established a new base in Oldbury, next to the Titford Junction and the Tar Distillers under what is now the elevated section of the M5. If you need proof, stick your boat into reverse below the Titford bottom lock and you will be rewarded with clouds of black tar and a smell which will clear even the most congested sinus. 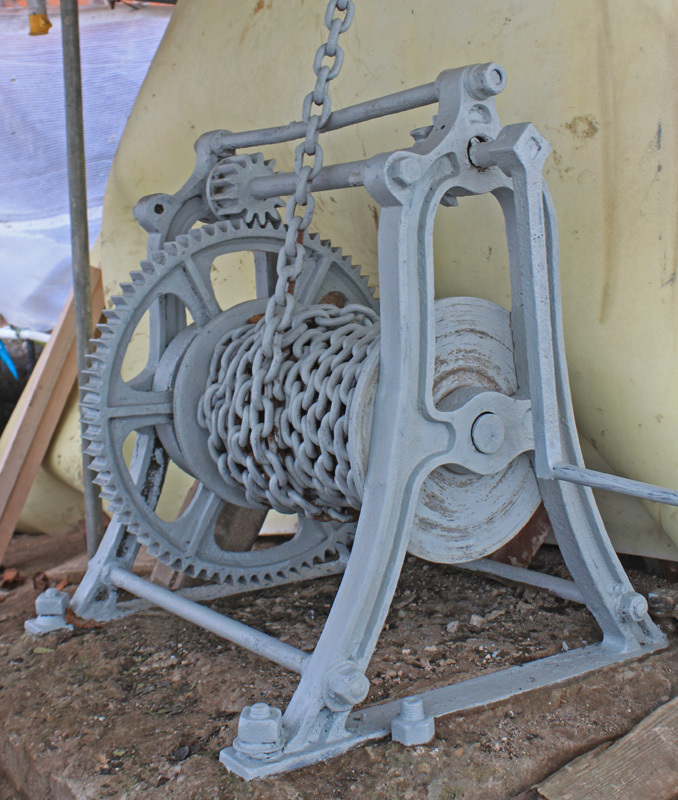 Claytons business grew and diversified, establishing a base in London and winning contract work to move liquid cargoes from Runcorn as well as gas works business from Leamington Spa and Banbury. 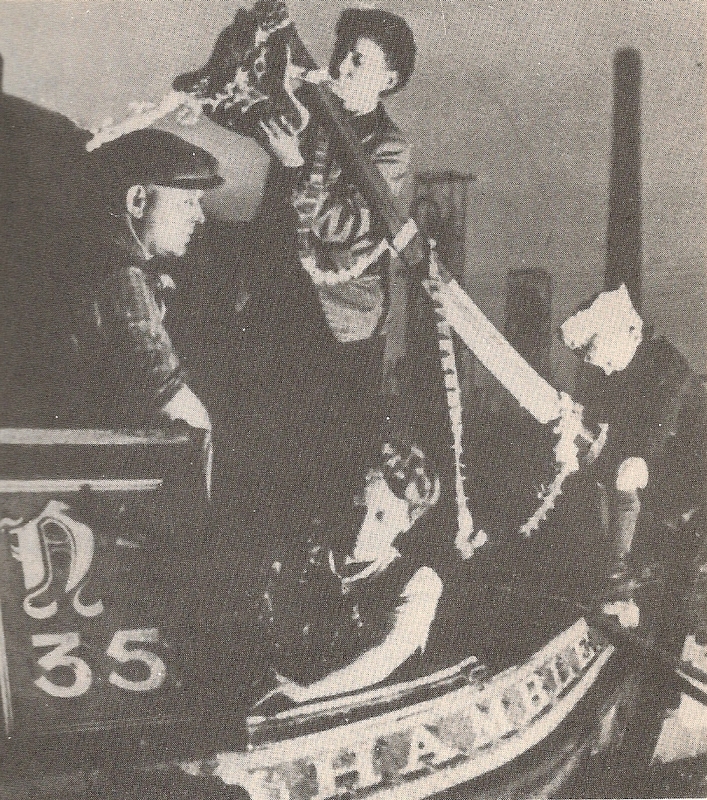 All in all their fleet grew to total about 70 craft at the outbreak of the second world war and over 90 in 1952, including 60 horse boats and 16 motors plus their butties. The end came suddenly. North Sea Gas came ashore in the early 1960's and almost at a stroke all the coal fired gas works closed leaving Claytons with no trade. That was the end of Claytons and, by and large, that was the end on the BCN as a commercial concern. So what about those boats? Well, they were built on contract or acquired second hand from all over the Midlands, but from 1916 they were names alphabetically with one letter each year so Alde and Adder were added to the fleet in 1916 and Blyth, Bourne, Bannon, Boyle, Brent and Beaver added in 1917 and so on. Many boats were bought in from other carriers and, as we all know, there is no bad luck associated with changing canal boat names. This alphabetical naming continued till 1939 with motorboat Usk and then the war came and new craft acquisition pretty much stopped till 1949 and then the practice lapsed. The tar boats were unusual in that they had their holds converted into huge integral tanks with tar pumped in and out - a boat could be loaded or unloaded in 15 mins. As a result they were distinctive with their sealed decks and bolted down inspection hatches. 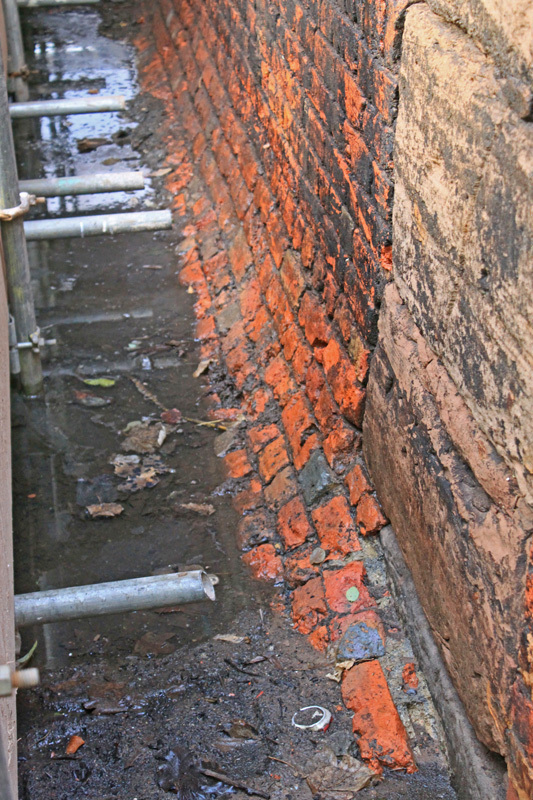 A feature on the BCN used to be the amount of oil and tar in and around the locks - and now I know where it came from. It must have been a filthy job with long arduous hours. This is just a taster of Claytons of Oldbury, but you probably get the drift. 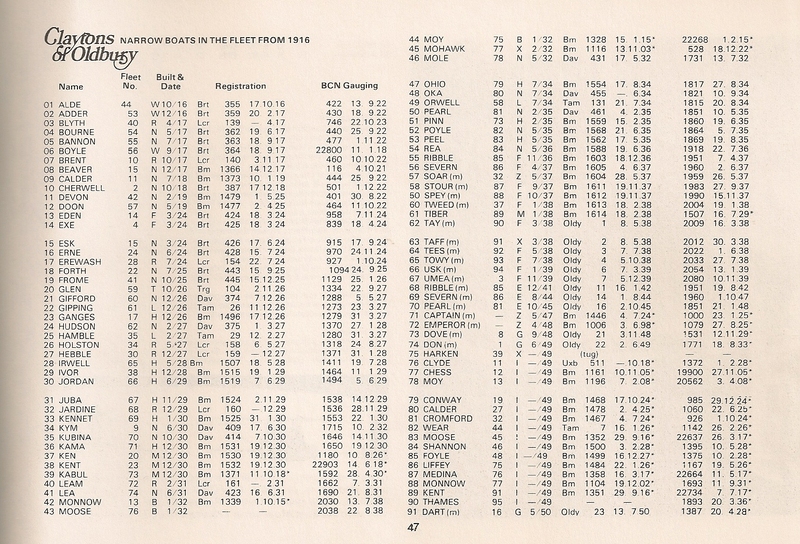 The last page of the book contains an intriguing list of all their boats from 1916 and it is interesting to scan down the list and see which craft have been preserved. 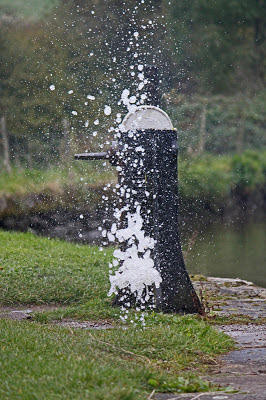 Spey is very much in evidence as is Dove plus of course the venerable Gifford which resides at the Ellesmere Boat Museum. 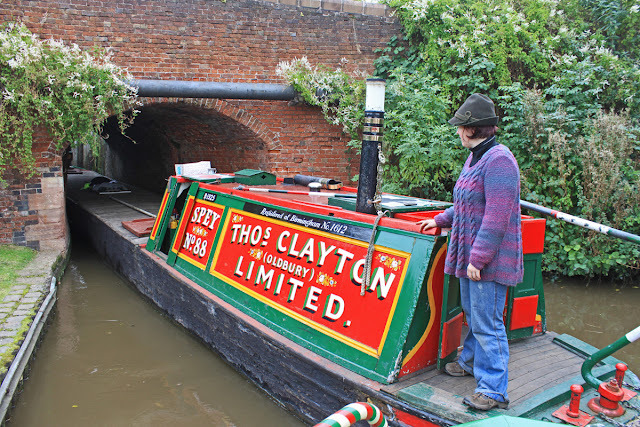 My friend Tony has a working boat moored in Gas St Basin, with a hold cover fitted to resemble a Claytons tar boat. 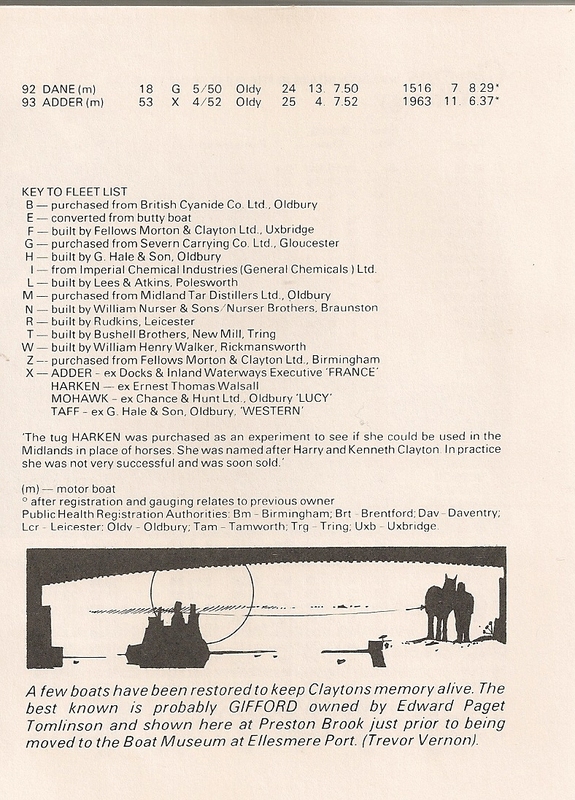 He used to own an ex Claytons boat way back in the 1960's and I searched the list in vain for mention of a Trent. I am guessing that maybe a handful survive either as a whole or in part? I find myself strangely captured by the ongoing chronicles of Commodore, accounts of travels half a century and half a continent distant. 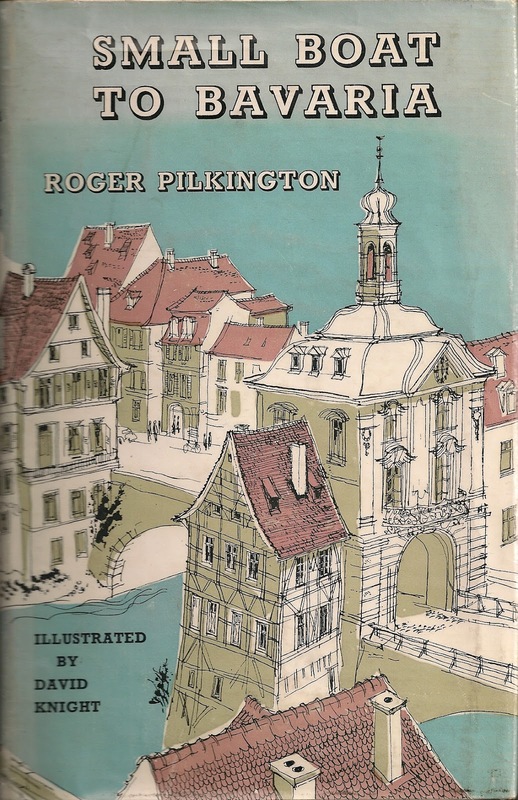 This time the Pilkington clan explore the rivers Neckar and Main, both tributaries of the mighty Rhine. 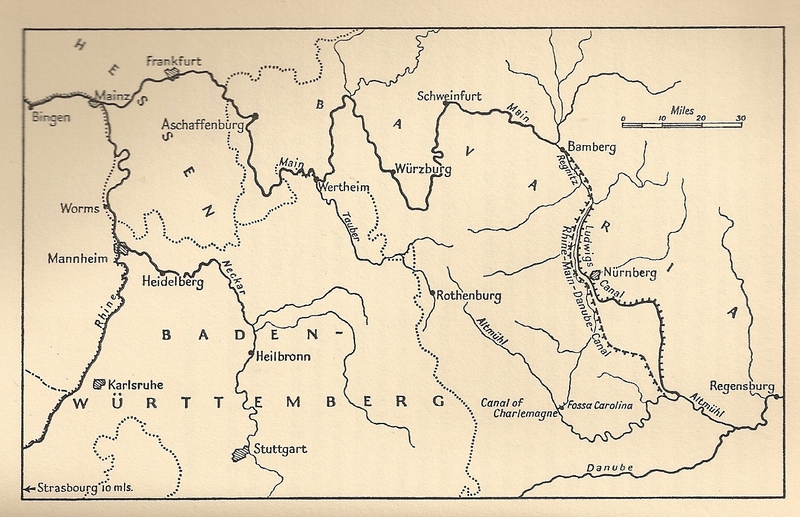 The first rose through Heidelburg towards Stuttgart and the second through Frankfurt towards what was to become the Rhine - Main - Danube canal, gateway to the east. This series is at times flawed, long on history and short of personality but not withstanding its shortcomings one gradually acquires an insight into the author, his tastes, convictions and passions. Pilkington has a thirst for history and this spills out as he threads Commodore through to the very limits of the navigations, taking a leisure boat where few non commercial craft penetrated. The Neckar indulged his passion for fine wine and ecclesiastical architecture, but the navigation itself also offered much scope for his observant eye. 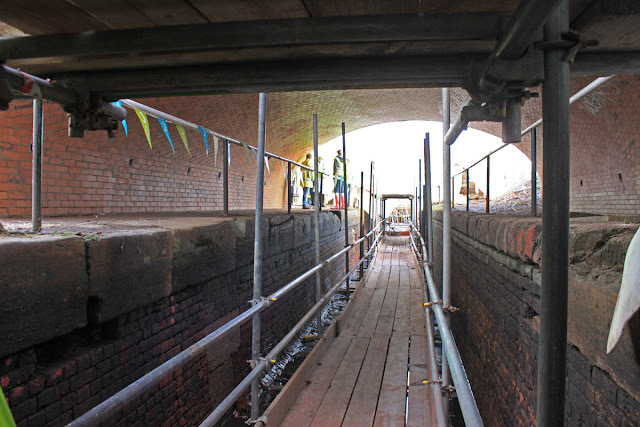 At each lock a toll was payable, but it appears that whilst the locks were too short and narrow for two standard boats to enter abreast or in line astern, two could share a lock if skewed round and the bows of the back craft brought alongside the stern of the one in front. This left a triangle of water at the back which was just right for Commodore saving a lot of time and money. 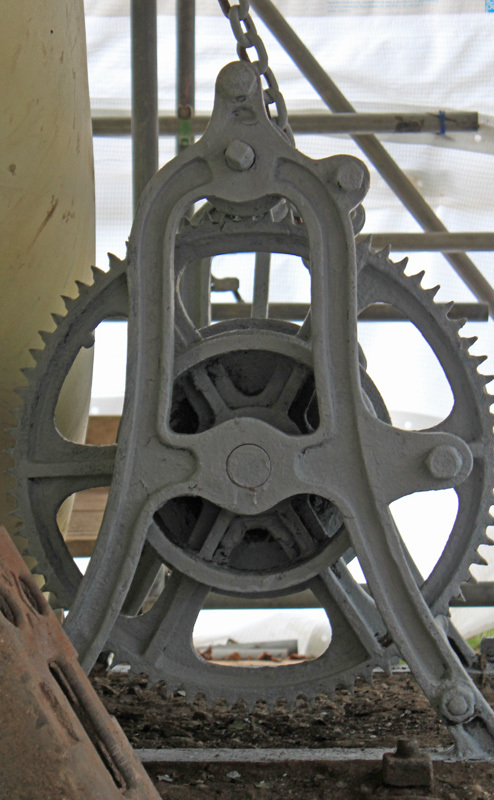 After a run down the Rhine and an over winter stop the intrepid crew made a passage up the Main, 250 miles to Bamburg following in the path of the old chain steamers which hauled themselves up the fast flowing channel using a chain laid in the river bed. 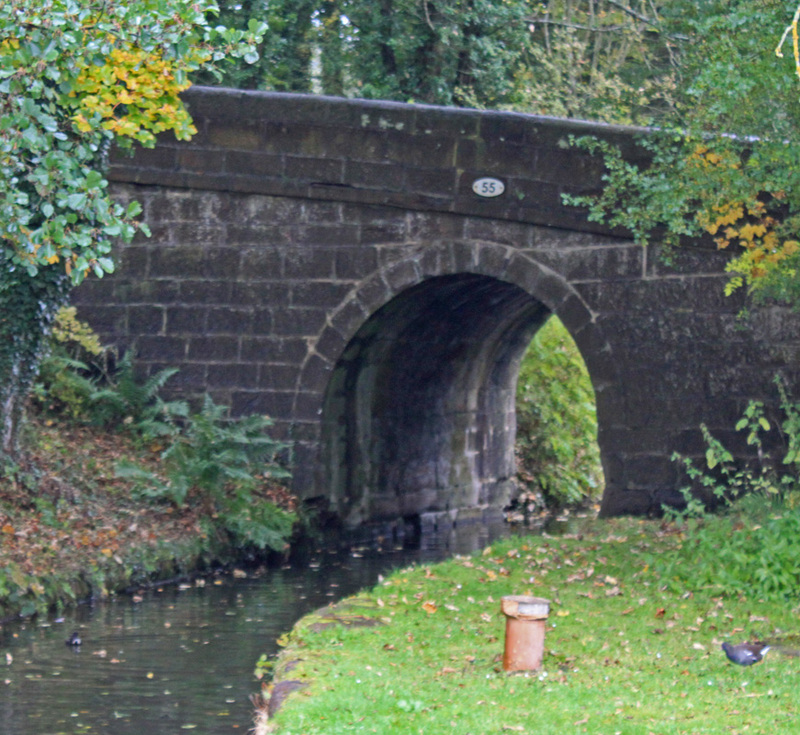 There were many stops along the way, and tales of adventure and death in every chapter, but from a canal enthusiast's perspective he saved the best till last. Today the waterway has been widened and extended into the Rhine - Main - Danube Canal which bridges the ancient watershed between these two huge river basin but back in the early 1960's this was still under construction and we were treated to an insight into the Prince Ludwigs Canal, a waterway which had remained just navigable till the end of the second world war and which saw a convoy of small naval vessels make the final passage. But the idea of a watery bridge between the Rhine and the Danube was nothing new and an even older waterway existed, but that was long before pound locks and probably involved much transhipment. What an idea - to take your own boat over the watershed of the Alps and down the mighty Danube to the Black Sea. Now that would be a real adventure. Another absorbing installment from a unique series. This isn't so much a book review as a book preview - a first in the annals of Capt Ahab and his Watery Tales. I have tried to read it, I really have, on several occasions mainly because its subject matter is quite compelling. Its a book about a man's passion / obsession with tracking down all the rivers which lie buried beneath the streets of London. I am thinking about the Fleet, Tyburn and Walbrook to name but a few - names you may have encountered in Rivers of London and its sequels if you have read them. The problem with this book lies rooted in its origins. It is based on an award winning essay for the University of Leicester in 1960 and its academic pedigree does nothing to enhance its readability. It is stuffed full with quotes and references with the footnotes sometimes at long as the core text. To make matters worse, the copy I have is an ex library book and lacks the vital pull out map to give shape and cohesion to what was an on the ground research exercise. And so the book has languished unloved and unread, but now that is all set to change. 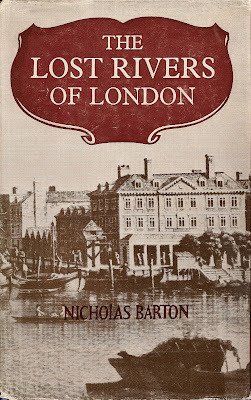 I was pointed in the direction of Diamond Geezer's London centric blogsite and there in the index is a section on the lost rivers of London. A written and photographic account of another mans obsession with this murky aspect of our capital. Does this all sound a bit familiar? So now is the appointed hour to revisit what can only be described as a worthy tome. Geography dictates that I can never undertake this exercise in person, but I can walk the streets of London vicariously on line, page by page and river by river all from the comfort of my armchair at home. Don't fear that I will become a couch potato - I still have a long list of BCN sites to visit and photograph. Who knows - they may even end up printed within the hallowed pages of Waterways World (part one of "The Arms of the Walsall Canal" is out in the January 2013 edition). I belatedly spent a last year's Christmas book token during a recent visit to York and purchased a copy of Simon Jenkins "A Short History of England". I have a strong interest in the overview, seeing the big picture and not getting lost in the detail. 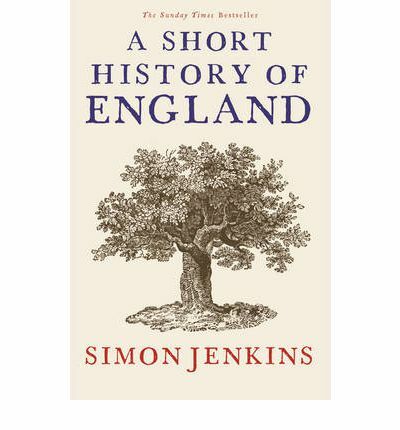 The title therefore offered hope of a helicopter view of England from the the Roman withdrawal through to the current coalition government - all within the the limitations of its 300 pages or 20 pages per century! So what did I make of the book? First off, its about England, not Britain or the UK. Its scope is defined by the geographic boundary set by the Angles who invaded a post Roman island and pushed a warlike bunch of Celts back to more of less their current borders. The ensuing tale is one of a nation almost constantly at war with either the Celts, the French or very occasionally with itself within the confines of civil wars. Our relationships with our neighbours remain in constant tension - not much changes there. But the core thread isn't the wars but the rulers who directed them, and their relationship with the rest of the population. Ever since kings needed to raise money to fight battles they were dependent on the population to raise taxes. This has always been an uneasy relationship because he who pays the piper calls the tune. The leaders of the day may think they run the country but in the final analysis, if the people don't give their consent we dig our collective heels in and force a change. Again - nothing new here. Perhaps it is some of the snapshots which are most telling - historical factoids if you like. When the battle with William Wallace was fought (think Braveheart) we (English) fielded an unheard of army of 70,000 men which represented 10% of the potential fighting force in the country. On that basis I calculate that the entire male population would fit into the collective seats of the Premiership - had they been interested in football. By 1700 the population had grown to 5 million, but there were only 4 cities with populations greater than 10,000. We have villages which are larger than places like York, Norwich and Sailsbury. The scene was therefore intensely agricultural and the development of the canals was against this backdrop. 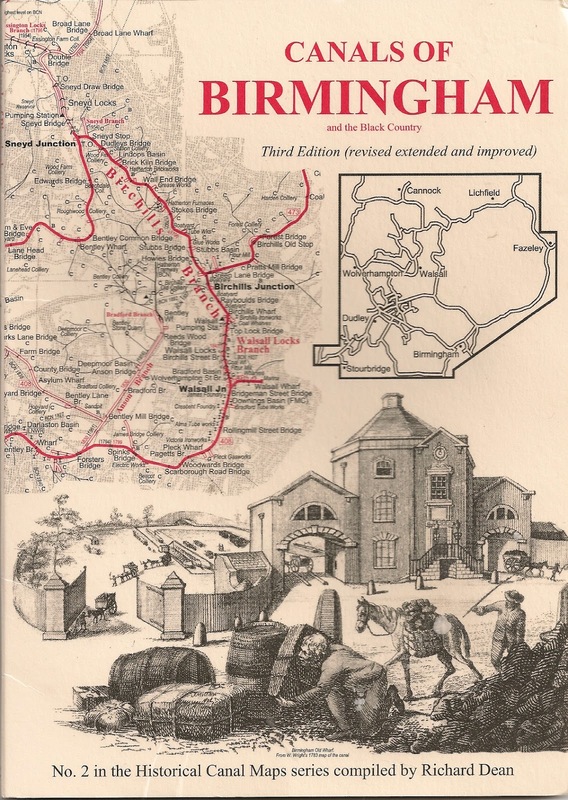 Come 1800 and the population had doubled and the great industrial centres of Birmingham, Manchester and Leeds had exploded, overtaking the old urban hubs as centres of economic wealth and political influence. And so, against this backdrop the political scene previously dominated by kings and their infant heirs moved to Westminster and an elected Parliament. The evolution of the modern scene was, as Bob Dylan put it, a slow train coming. Each successive government built on the progress of the one before, sometime shading the colour / trajectory a bit, but pre election rhetoric rarely survives in the face of everyday reality. Perhaps the most powerful take away is that change does not come from Parliament - they merely progress our collective wishes. The real power for change comes from elsewhere, changes in society which politicians tend to begrudgingly adopt. So what of the future of England? After expansion to a United Kingdom, a world Empire and then back down again we seem to be struggling to find our place on the world, or even in Europe! Our age old feuds with our Celtic neighbours is mollified by devolution and probable ultimate independence, after which we will be back within our Anglo Saxon borders. An ethnically diverse mongrel nation with strong streaks of independence and creativity thrown into the mix in equal measure. England - this sceptered isle - there is nowhere else like it. We will get the government we deserve and in spite of their worst efforts - but we will be fine. The Tidy's are exiting 2012 with a bang, or perhaps you could better describe it as both barrels of a proverbial shotgun. Not content with another of my "lost canals" articles in Waterways World (January edition) Helen has found fame as a page three girl, oops - sorry I meant a three page girl in Canal Boat. The difference is both subtle and profound, if you know what I mean? Lets deal with my lost canals item first. 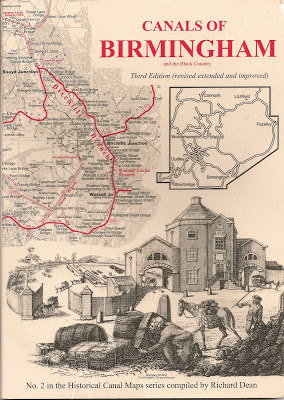 Having recently completed the BCN Marathon Challenge (again) and having slogged my way along the Walsall Canal (again - twice) I started to wonder if it was possible to write something passably interesting about such an obscure waterway, one rarely travelled and generally unloved. 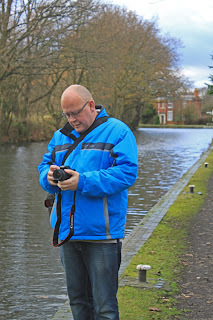 I am not sure that even us BCN die hards get too excited by the prospect of another trip along the Walsall. But then I took a fresh look at its line and reflected on the huge number of abandoned sections which link into it, lines which I have painstakingly researched and walked in the last few years. And so an idea which was conceived during the Olympic opening ceremony, gestated during the water events at Eaton Dorney and delivered kicking and screaming to life as the lovely Miss Ennis bounded to a triumphant gold medal on the middle Saturday. 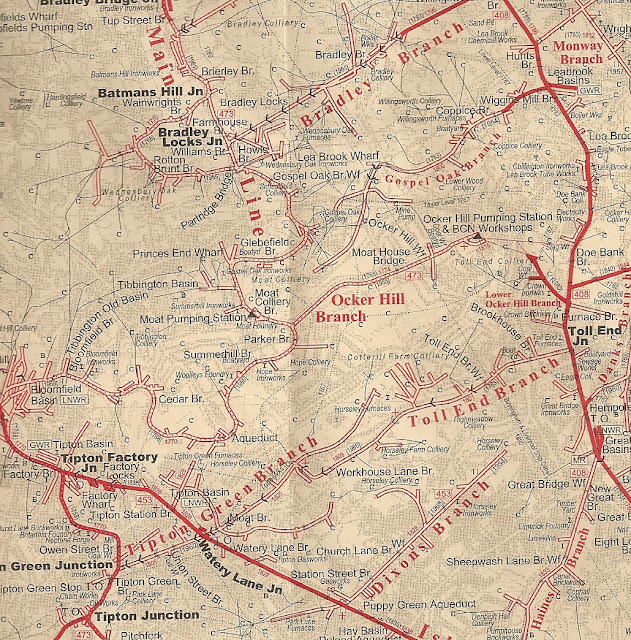 The result is a two parter which will conclude with the northern arms (Gospel Oak, Toll End, Bradley Locks, Anson etc) in the February edition. But if we view the above as the entre, we now move onto the main course. 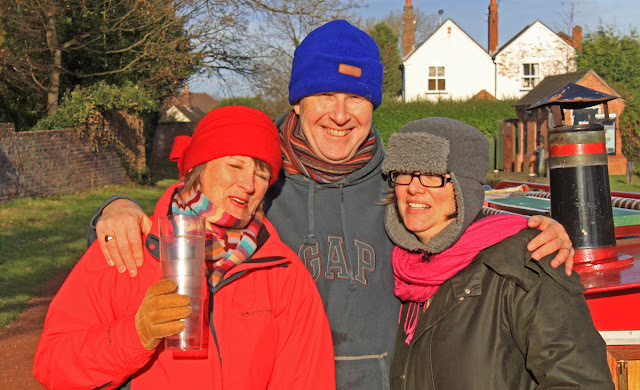 You many of you will be well aware, Helen has established Wild Side Preserves making jams, jellies and chutneys and using, wherever possible, wild ingredients foraged from the hedgerows and towpaths. A goodly number of you will also be aware that her rather scrummy end results are hitting a sweet spot with the public at boating festivals, craft fairs and on the internet. And before any of you raise the point - yes she does have written permission to forage from the Trust! We have been bowled over by the enthusiasm shown for her business, and there is a growing band of customers who are returning time and time again for further sticky fixes. 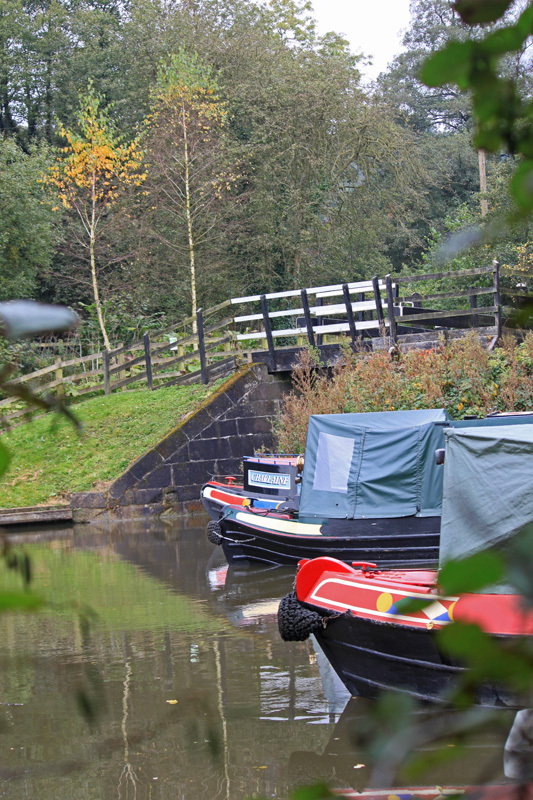 This interest has captured the imagination of several journalists and it was really exciting to be joined by Helena Lightbody in the summer who was writing an article for Canal Boat. That article, all three pages of it, is in the current January edition. Wild Side has evolved by leaps and bounds, on reflection possibly a little faster than was desirable. We started the summer wondering if anyone would buy her preserves and ended wondering how to make enough to satisfy a burgeoning demand! So for 2013 you will be pleased to learn that we are going to be a bit more focused in our sales activity, and will view the boat festivals as our core market. For us, the preserve business is all tied in with boating and, if we are absolutely honest, they are the events we enjoy attending the most. During our visit to the Banbury Canal Festival back in October I finally met Neil of Herbie and I couldn't resist asking for a look at one of his infamous Canalometers. I had heard about them and even seen a version or two on his blog, but never actually used one. Its fab - great - simple and hugely effective. Once aboard, what is the most commonly asked canal related question? It has to be: "How long will it take till we reach x". I waffle and give a vague answer based on pure guesswork and throw in some comment about canal time being stretchy to allow wriggle room. 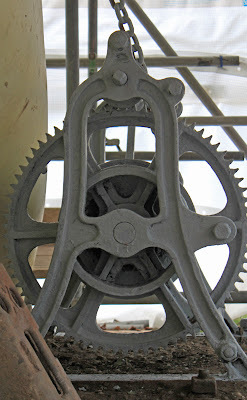 But the Canalometer brings a veneer of easily accessible science to the proceedings. 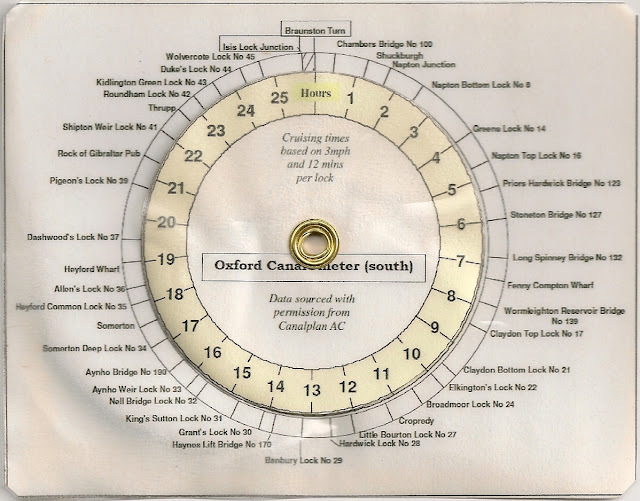 At its core its Nick's CanalPlan data on travel times between points on the canal using assumed travel speeds and lock times but its mobile, able to be slipped into the cover of your canal map book and used as a quick reference guide. The one he gave me is based on a single canal, the South Oxford, marking the relative landmarks between Braunston Turn in the north and Isis Lock in the south. Its set out as a pie graph in the background and a second smaller disc with 0 to 25 hours marked out. By zeroing your current location you can work out how long it will take you to get to whatever other location you fancy. Like the standard Canalplan output, it may be a bit optimistic or pessimistic but you soon get a feel for how the timings relate to your usual speed of travel. For us, we travel a bit faster. So, I am a convert. Its a handy tool but sadly Neil hasn't created a version for the Midland and Northern canals where we tend to hang out. None the less, its a great idea. Oh the joys of being unwell with too much time on my hands. 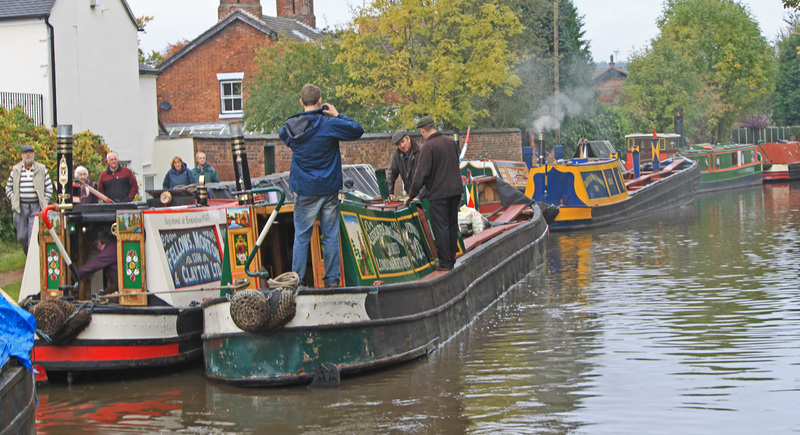 We took a late season run to Penkridge on Saturday, introducing some new friends to this boating malarkey. They stayed with us on Friday night which allowed us to make a prompt start and be on the move by 10.00am - rather important as we approach the shortest day of the year. 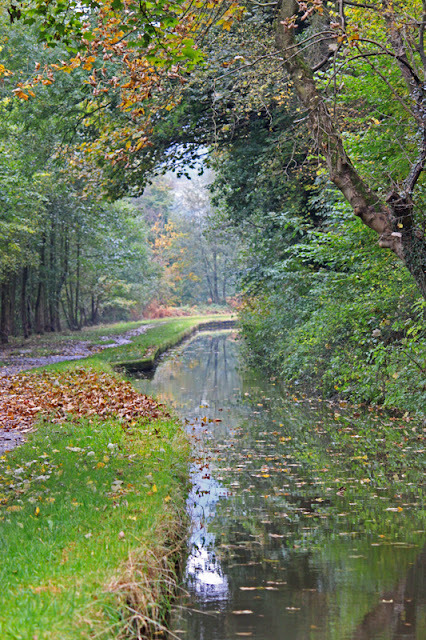 For the last few days I had been watching the weather forecast and keeping a close watch on the Tame Valley canal which I cross each day on the way to work, checking to see if the frosts had caused the canal to freeze over. Now dont get me wrong, I quite like bashing a bit of ice but it is terrible for the blacking and I am not planning a slipway visit for another 18 months, so I was ready to chicken out if there was much crunchy stuff. As it turned out the day dawned clear and bright, which is about as good as it gets at this time of the year. 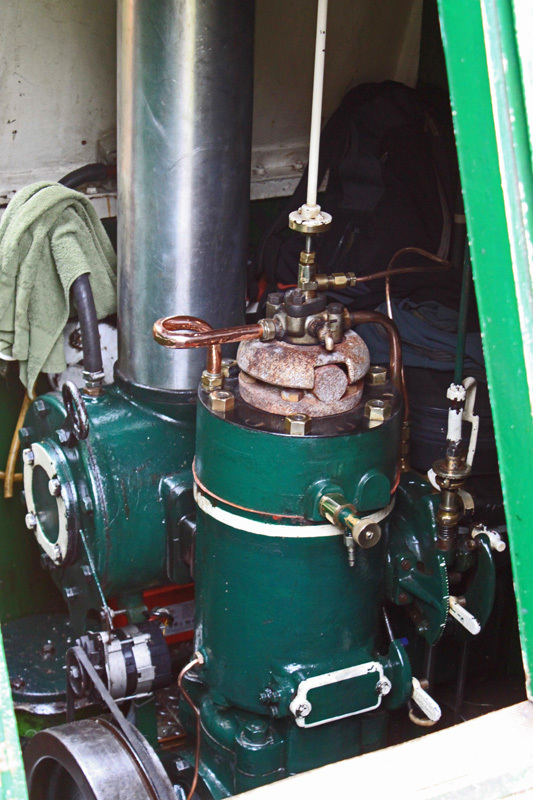 There was barely a trace of ice in the marina so we roused Wand'ring Bark from her hibernation, fired the stove and stunned the engine to life. By rights this trip shouldn't have been possible as the canal at Gailey was due for closure as the boatyard was digging an offline mooring. 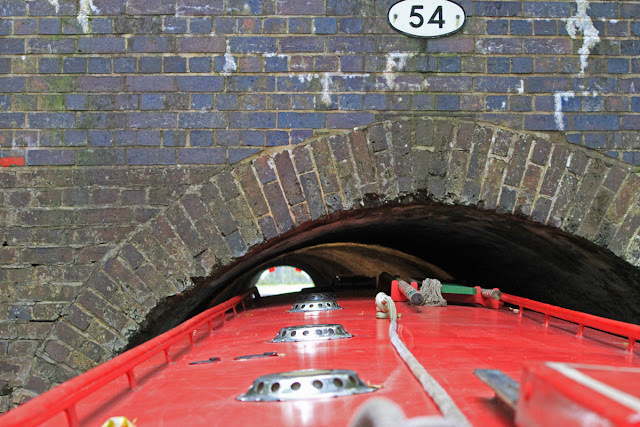 However, some issue with the contractors has caused a delay so we were free to make our way to Penkridge, passing Nb Victoria in the second lock down. I hadn't come across Victoria before, a 1931 Royalty Class Narrowboat plying its fuel trade between Market Drayton and Stone / Great Haywood. In fact I don't think the route has had a regular trader for quite a while. There was some light brash ice about but nothing of note and we rolled up into Penkridge basin at about 1.00pm and settled down to a lunch of sausage wraps and some take out pints from The Barge. To my consternation I looked at my watch at 2.00pm and realised that we might have a bit of trouble with the light getting back! We pressed on in the gathering gloom, nattering away so animatedly that I completely forgot to take and photos, apart from a few at Penkridge. 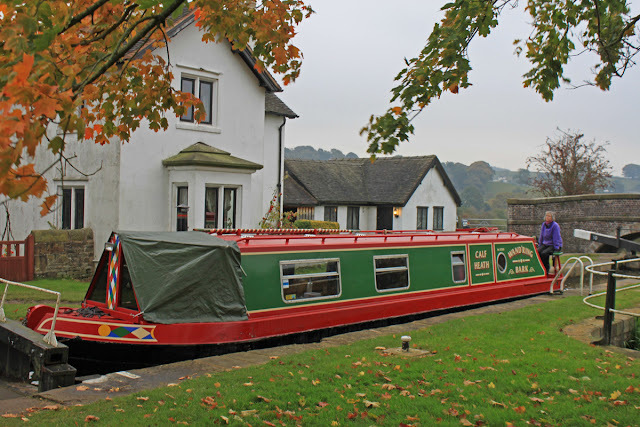 Our guests tried their hands at steering and locking and apart from a spot of lock surfing at Rodbaston Lock, they were naturals and became instant canal converts. In the end we crept into the marina in the fading light, just enough light to get into our berth but completely dark by the time we loaded up the car and set off for home. 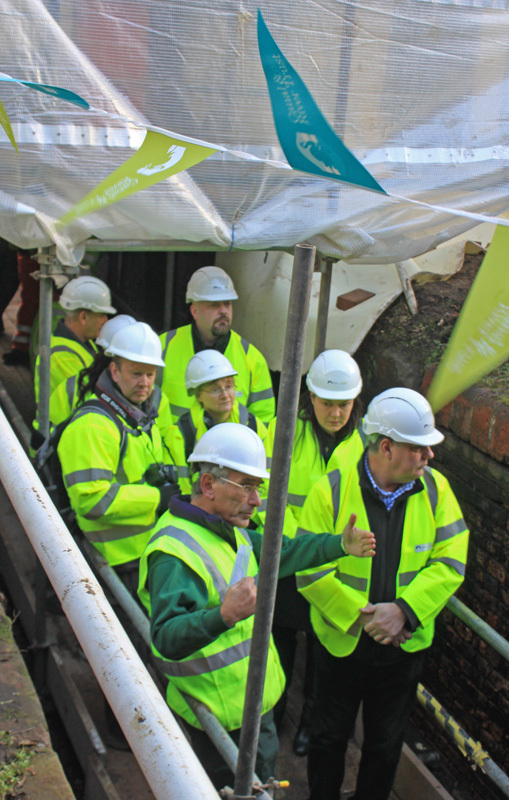 The increased focus on open days on the part on the Trust is a really good idea - giving local people a backstage pass to the less usual canal repair projects. Kings Norton played host to one of the Trust's latest open days, this time taking a fish eye view of the classic Guillotine stop lock which is having £200k lavished on it to ensure it stands proud at the head of the Stratford Canal for another 200 years. 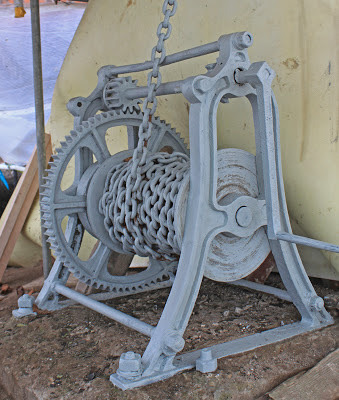 The inclement weather had put the project behind schedule and the open day had already been delayed by a week, and with the day dawning blustery and damp I wondered just how many people would attend. Our Sat Nav did its best to get us to the guillotine lock, which hides beneath a road crossing. 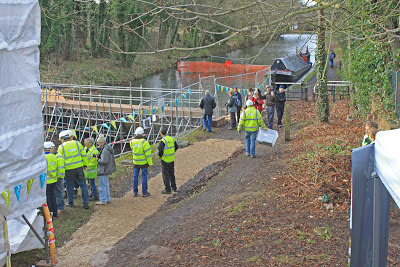 We found ourselves in the company of 60 or 70 visitors plus C&RT staff, contractors and volunteer guides. So was there enough there to justify the visit? Well, yes - and no. We got the distinct feeling that work had not progressed quite as planned and the iconic landmark structures, the guillotines, remained shrouded in scaffold which was a bit like visiting Blackpool to view the restoration of the tower only to find it still covered up. The current plan is to have the site reopened by 22nd Dec when the contractors finish for Christmas but if you are planning to get into Birmingham for the festive season I think you may need to reconsider the Knowle / Camp Hill option (Tacet take note). As for the site: we were fitted with hard hats (necessary), donned high vis jackets (a bit OTT) and our progress along the bed of the lock was overseen by first aiders which represented Health and Safety gone mad. 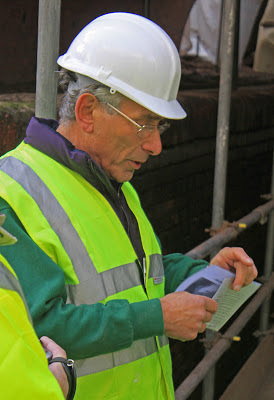 We climbed down into the chamber and were given a guided tour by the resident expert Ivor Caplan. The lock was only ever a stop lock but it threw up a huge surprise. 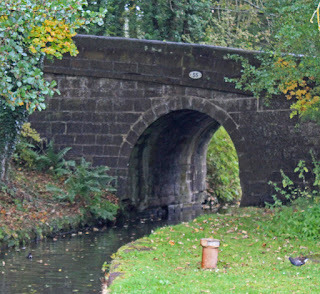 I bet that few of you knew that it was originally built as a wide beam lock - 14.5 ft wide and capable of carrying the big boats which were planned for the Worcester Birmingham before the builders scaled back their ambitions and made Tardebigge narrow gauge instead. 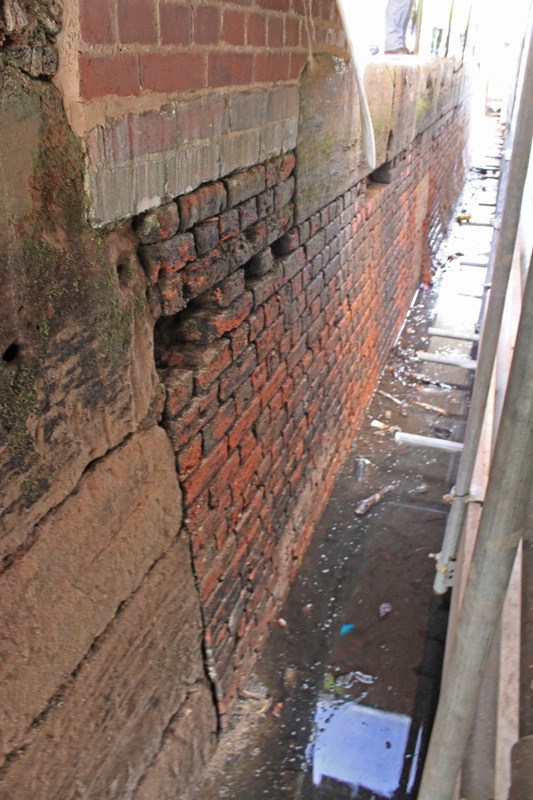 What you see beneath the waterline is, on the towpath side, the original lock chamber with big sandstone coping stones along the top. 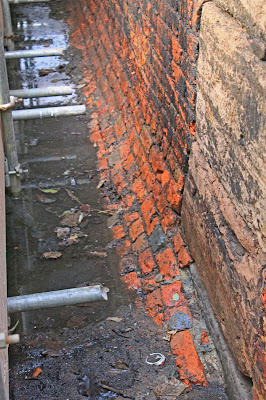 At the bottom the brick sides sweep round to the floor in a smooth curve like an invert, but on the other side the wall rises straight up and has more traditional bull nosed brick copings at the top. 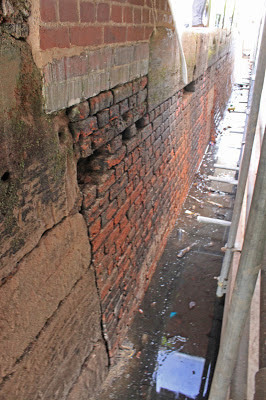 What is more, you can see the rectangular lock gate recesses for the big double lock gates now all bricked up in the lock walls. The way things were "back in the day". 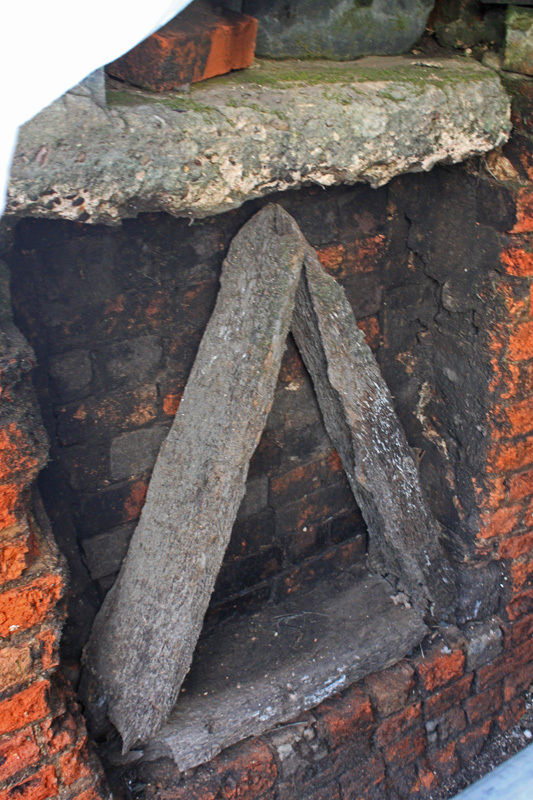 The original lock chamber must still exist under the bridge and the "new" lock wall was built half way across. 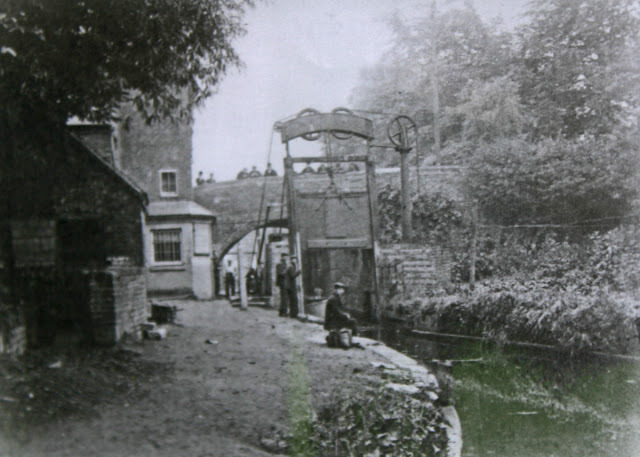 The old lock gates were removed and rather than build new lock gates, recess and paddle culverts they simple slotted in a guillotine gate at each end which took up little space and presumably was a cheap option to control the very modest difference in water levels. I never did find out why the guillotine was set off vertical. Here are some photos of the de watered lock - I don't expect I will get another opportunity to see this unique structure again. The planned early start didn't materialise. We woke at 8.30am and once again we didn't get on the move till 9.30am - we are getting later and later as the week progresses. 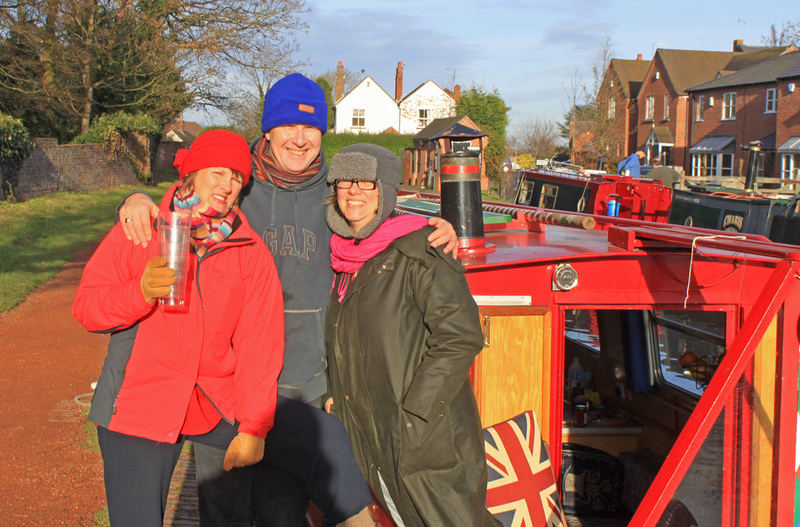 Helen was busy jam making with all our foraged goods so I progressed single handing through Trentham and then Meaford Locks - meeting just two boats all morning. Stone, by contrast, was playing host to a historic boat rally which featured several well known craft including Aquarius and Spey. 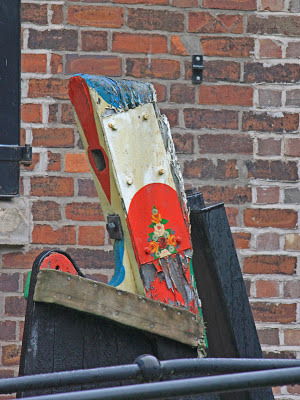 Poor old Spey was being hauled ignominiously into town having picked up a bladefull of stainless steel back at Huddlesford Junction, an impediment which demanded a total extraction from the canal. Spey's pause next to the Stone water point gave me an opportunity to learn a bit more about her. As far as I can tell she was built in 1939 and operates on her original Bolinder engine. 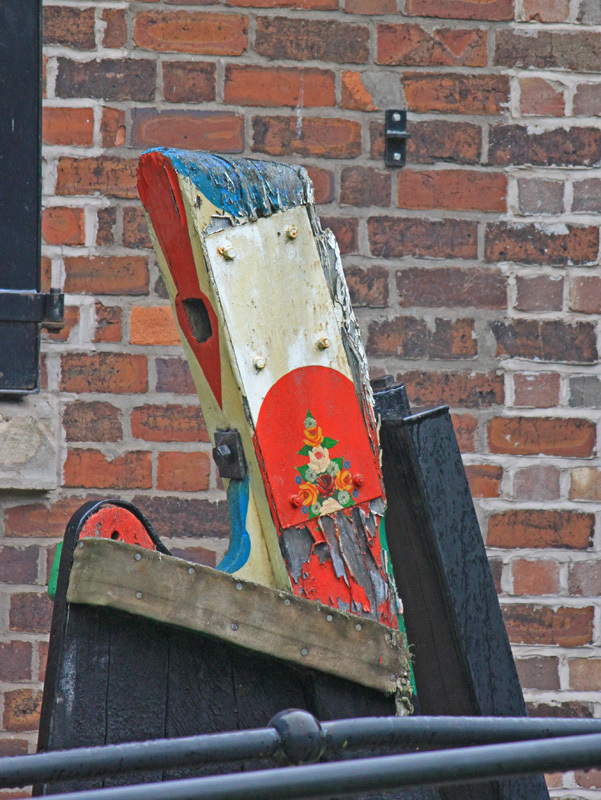 Like Triggers Broom, its hard to tell which bits of this venerable old wooden lady are original. 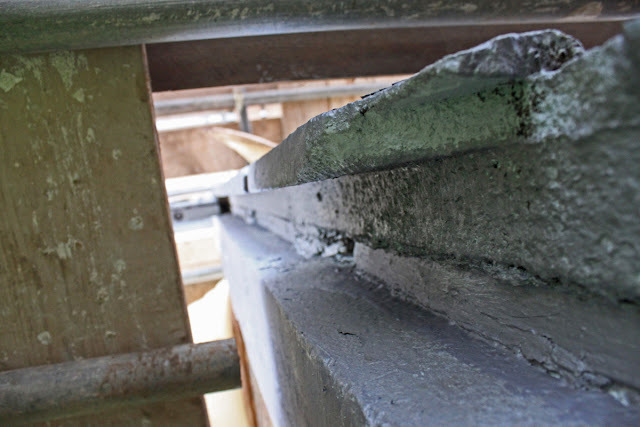 Over the years more and more is being renewed - the whole bow section last winter and with the counter going soft I suspect that the back will soon be up for "the treatment". Spey is now owned by a syndicate of 10 enthusiasts committed to keeping her going. 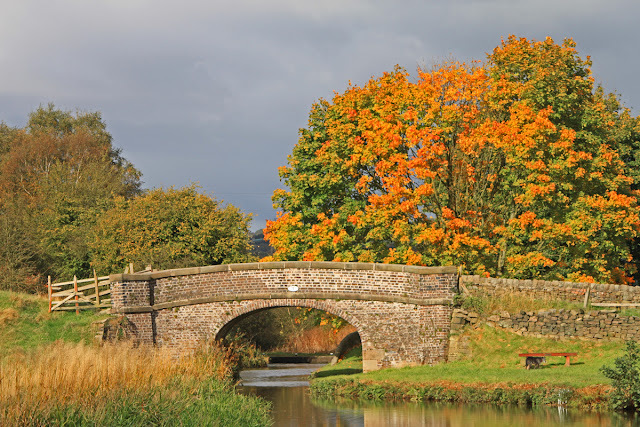 Then it was on through Stone, picking up a couple of pints from the Star and easing us on our was down the Trent and Mersey and picking yet more sloes as we went. 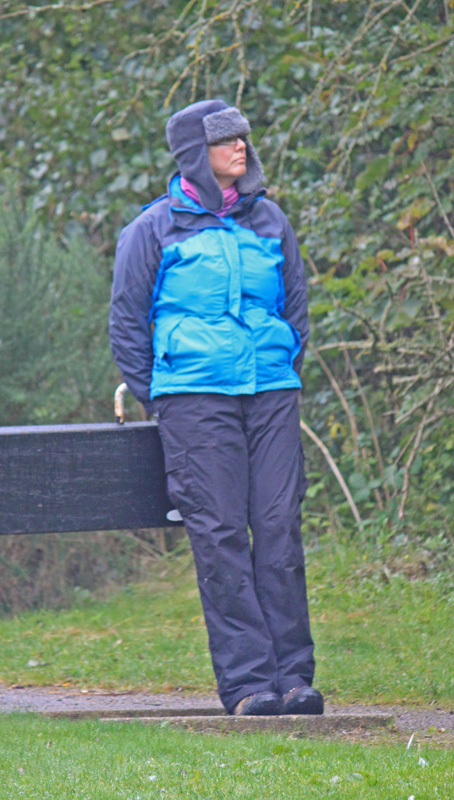 We rounded Gt Haywood Junction at 5.30pm and moored just above Tixall Lock. We went to sleep with the rain rattling on the cratch cover but paid it little notice. We were warm and snug in the boat and the drumming of the rain eventually lulled us to sleep. Little did we appreciate just how much rain fell last night. 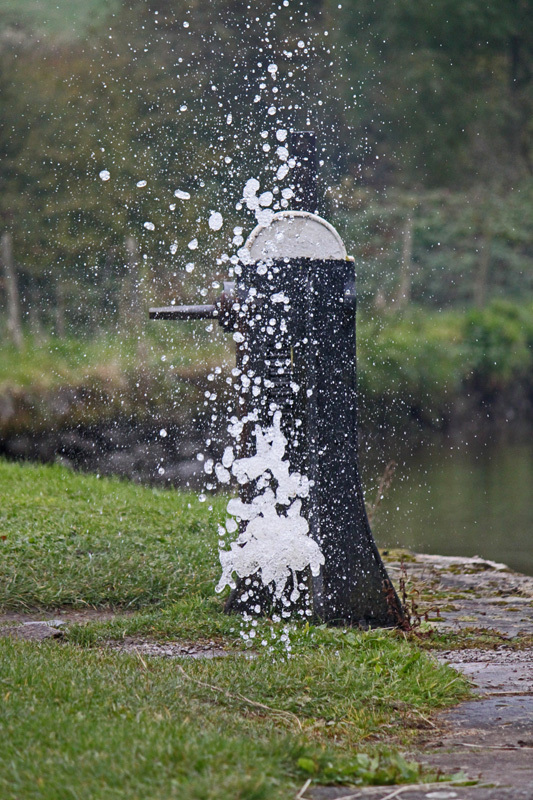 The first inkling that something was amiss was when I climbed over the Leek Tunnel to get some photos and discovered streams of water cascading down the path. 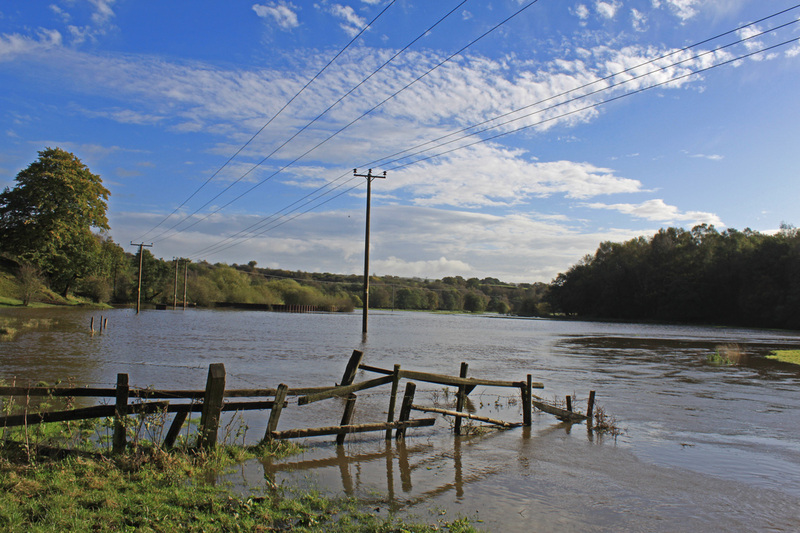 That and the fact that the water level had risen by about 4 inches. Last night we had looked down on the meadows with the little Churnet winding it's way from one side to another, but what a difference a night makes. 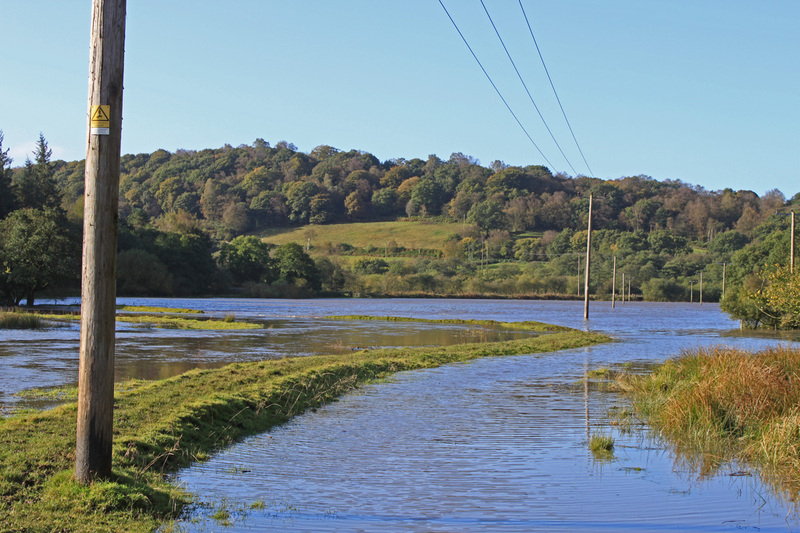 Instead of grass I saw a shimmering lake with a roiling flow tearing along the course of the river and tumbling over the banks into the surrounding flood plain. Roads, fences - everything was gone. I could only guess at the state of the river through Consall Forge, and what a relief that we opted to return upstream yesterday! 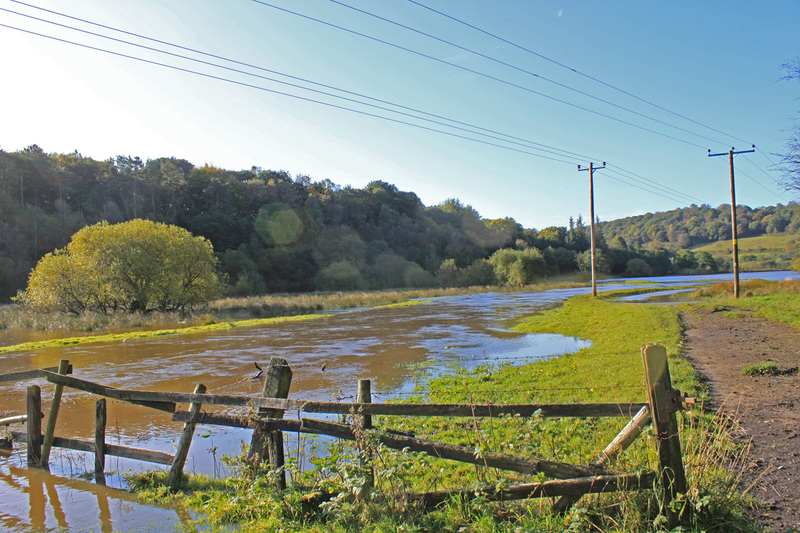 The flow can be a bit confusing when viewed from the canal. At the start is was flowing west, alongside the canal and then a mile or so later we were against the current - we had turned a corner and entered a different valley. We had more sun today, and after all the rain the air was clear and offered great views. But this improvement came at a cost as a cold northerly wind picked up and wormed its way through our clothes. 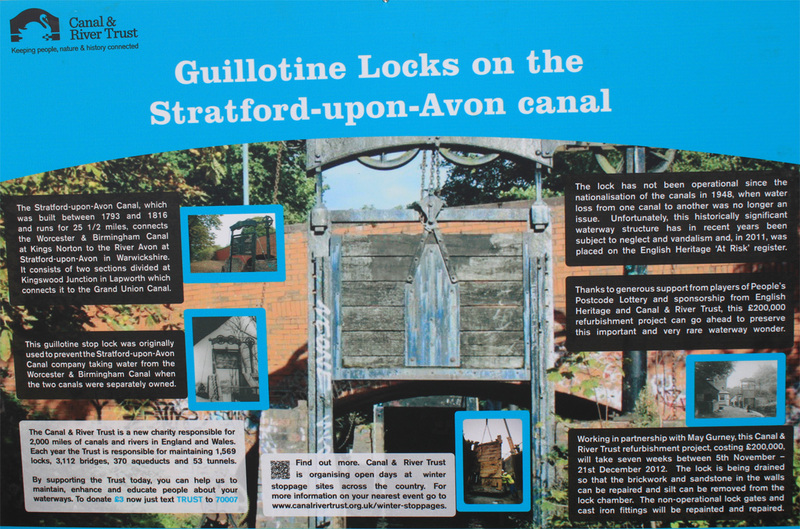 Stockton Brook locks were against us, indeed as were all of today's 14 locks as it turned out. The route offered good foraging including Blackberries, Rowan Berries and Rose Hips. We has another pause at Milton, visiting the bakery and Abacus Books, plus observing a very youthful and a very full river Trent spilling into the gardens of the riverside houses. 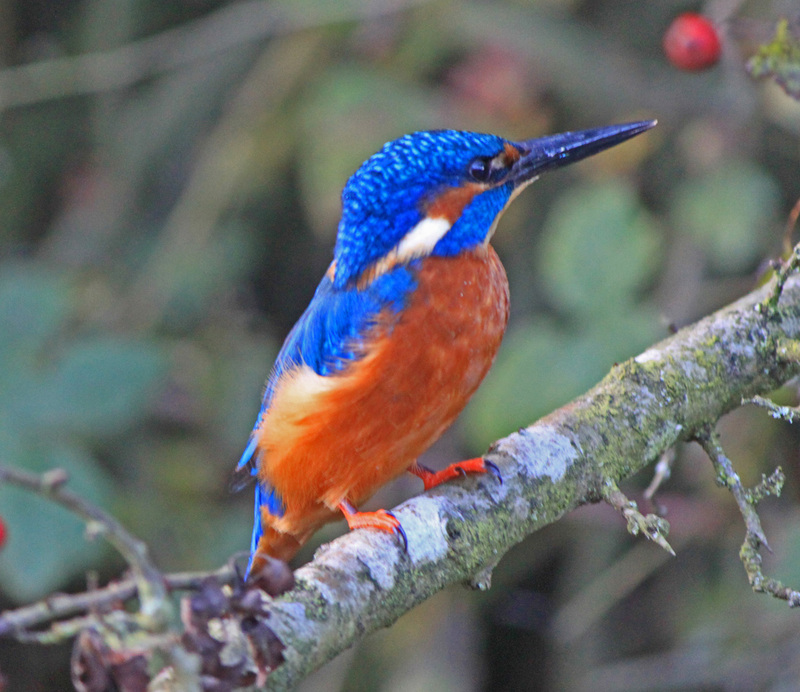 Northwood, offered an amazing shot of a Kingfisher. He swooped into a bush beside the canal and then stayed there as we crept past. Helen steered and I concentrated on shooting a series of images, one of which was satisfyingly crisp and clear. 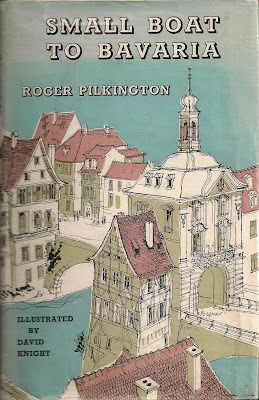 Regular readers have seen it before but its so charming I have posted it again in the context of our trip. We reached Etruria at 5.00pm having seen just one boat on the move but with a clear sky overhead we decided to press on into the sunset, reaching Hem Heath in the last wash of evening light. The day dawned grey and dreary, with rain falling on an off from beginning to end. Rather than turn round and head upstream we decided to spend the morning visiting Froghall and hopefully find some fruit in the grounds of an abandoned farmhouse nearby. The river section ends at Flint Mill lock which is being slowly converted into housing. 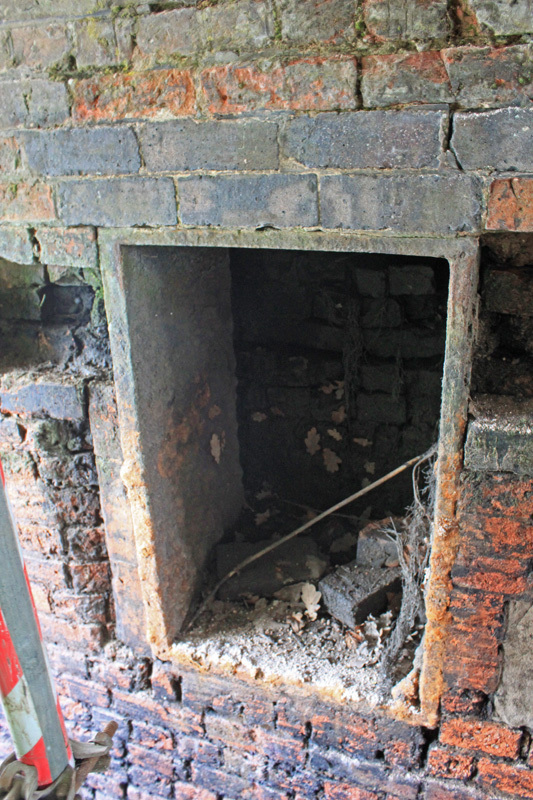 WB, as usual, gave the height barrier a hearty wack but we know better and set to, stripping everything off the roof to let us squeeze through the diminutive proportions of the Froghall Tunnel, the smallest on the system. I am getting better at the Froghall and ran through with just one light touch. Instead of the usual emptiness of Froghall basin we found two other narrow boats present, but they were both closed up and laying over. 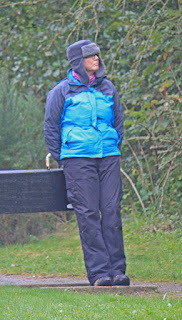 In the event the foraging wasn't great, just some blackberries and apples - but it could be worse. The rain eased off as we returned to the tunnel and back to Consall Forge - the only boat moving. 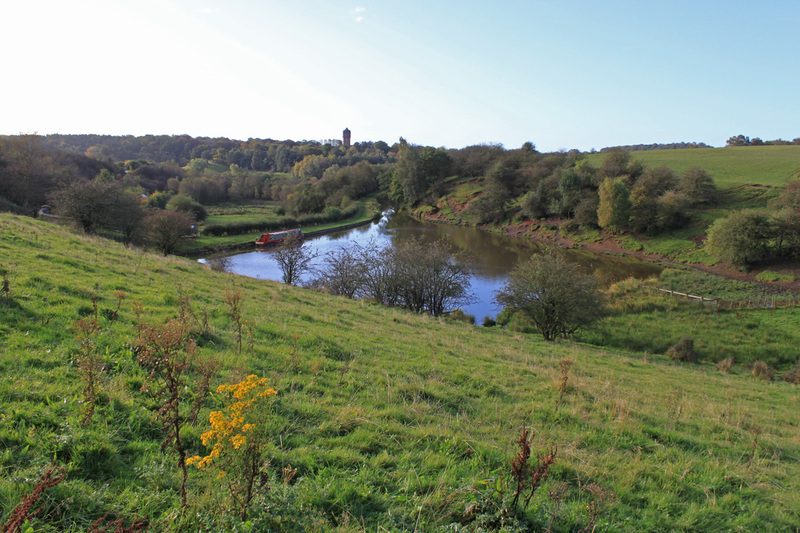 We paused at the Black Lion, picking us a couple of pints of take out, and then back up the docile little Churnet. We found sloes, blackberries and rose hips, but all the pears were in private gardens and beyond reach. Then it was up the Hazelhurst three, finding the paddle to the side pound at the bottom lock firmly and emphatically blocked. No playing with the side pound this time! Then it was round into the very slow but pretty Leek Arm, the trees arching over the channel which expands and contracts like a pair of bellows. We stopped short of the Leek tunnel, mooring in the wide as the rain really started to fall. Its a lovely spot, if a bit shallow.